shot is taken by using mobile phone! i forgot to charge my camera!! What breed of cat is Garry? He looks like an Australian Myst. 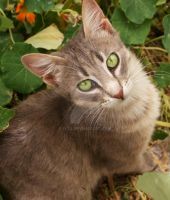 oh just a grey Tabby!not a special breed!he lives in our Aunt's garden!he is an outdoor cat and we all adore him! thank you for faving him,dear! thank you for liking him,dear! thank you again a million for the addition,dearest! thank you for liking my little devil!! aaww!thank you for liking him!! aaww! !thank you very much for liking him! thank you so much for liking him!! thank you for liking him,sweetie! He has no worries at all LOL! oh thank you!glad you like him so much!! i was trying the N8 nokia's camera! thank you also for the llama! yeah!he is the sweetest rascal,ever! thank you for liking him dearest! i was allergic,too but now things are going much beter!i don't know why or how it happened! i adore cats sooo much as well!! i love this ninja cat! It's a pleasure thanks for sharing it! Cute little Garry!!!! HI!!!! haha, super awesome Isa!!! Give him a hug for me!!!! i will Joey dearest!! thank you so much for lliking him! yes he is the sweetest devil,ever!! thank you so much for liking him,Chris dear!